Already in the middle of the 19th century, efforts were being made to construct a sheltered fishing port on the east coast of Rügen island, however, at that time these plans were not carried out. The construction only started in 1889. 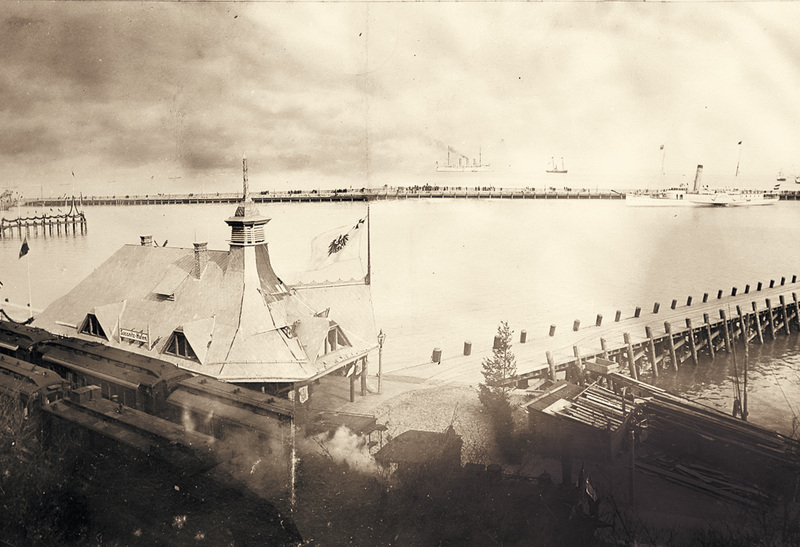 At the outset, it was planned to build a 380m-long pier running parallel to the shore, its northern end to be connected to the shore only by a wooden bridge. Through this opening, flints carried with the current, were supposed to pass through the harbour. Its builders feared, that a pier directly connected to the shore would lead to these flints being washed along the pier into the harbour’s entrance, silting it up. 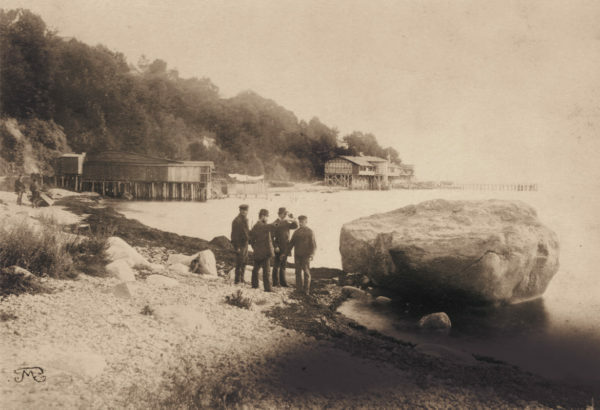 Though being a new source of income for the inhabitants of Crampas and Sassnitz, this construction process also massively damaged the shore: Removing boulders to be used as construction material from shore areas stripped the cliffs off their natural protection, leaving them exposed to the waves. Years later, this led to expensive shore reinforcements and protective measures. 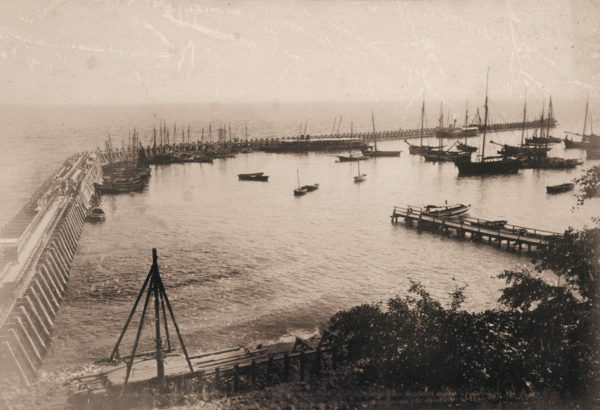 The construction of the pier went through different stages and was only finished in 1912 as the increasing port infrastructure – i.e. steamship traffic and, later, railway ferry services – required even more protective measures. 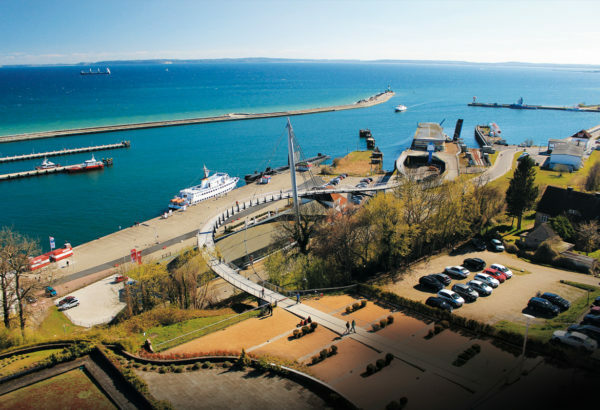 Sassnitz’s pier finally reached a length of 1,450 meters and it was Europe’s longest pier until 2013. 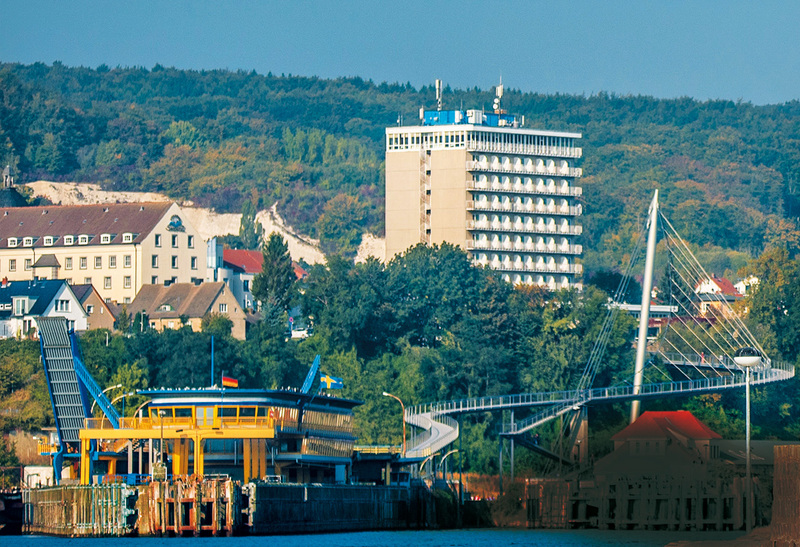 From the beginning, Sassnitz has been a fishermen’s town. However, the local fishing industry never managed to gain much profit and, therefore, fishermen soon started to form collectives to help them bear the expenses for boats, nets and other supplies. One fisherman on his own did not have the financial means to cover such costs. His existence and that of his family depended exclusively on the fishing boat. Already in 1695, a Swedish land survey reported: “The inhabitants of Sassnitz are all, as had been said, fishermen. They own four boats, which they use to go fishing. There are three men on each boat. On one boat, there are four.” These collectives had all been organized to cope with the hard work and help each other personally and financially in times of need. 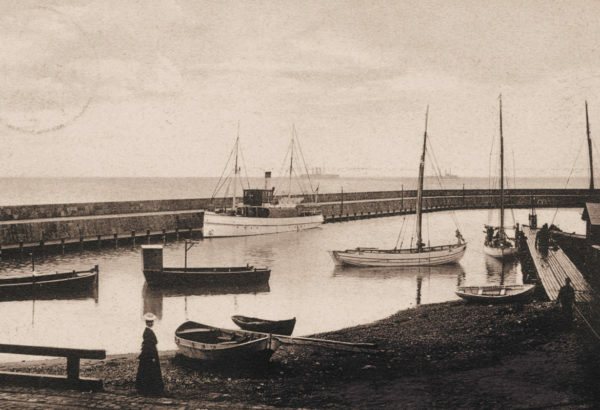 In 1889, after the construction of the port, the fishing boats continuously disappeared from their traditional landing spots on the beach promenade. For non-local fishermen, the new, sheltered fishing harbour now became their first place to go on their long fishing trips. 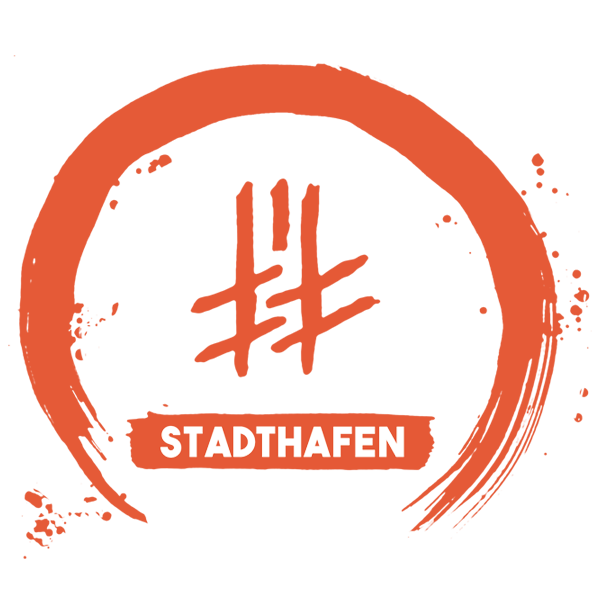 Since the 1950s, the FPG (Fischereiproduktionsgenossenschaft/fishing industry producer’s cooperative) was located at the old fishing harbour. Similar to the collectives, its members held joint shares in production equipment. 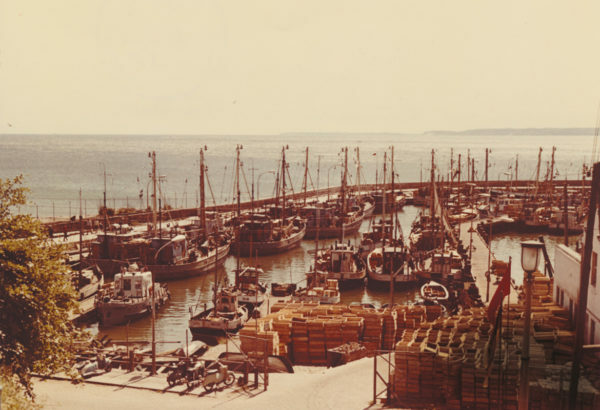 New market conditions following the political change in 1990 as well as stricter fishing regulations led to a considerable decrease in fishermen being organized in cooperative societies. When on February 7th, 1949 the first twelve 17-meter-fishing cutters started operating in Sassnitz, the expansion of the GDR’s second largest fishing fleet had started. It was a reaction to SMAD-order no. 11 (Soviet Military Administration in Germany) issued on January 11th, 1946. 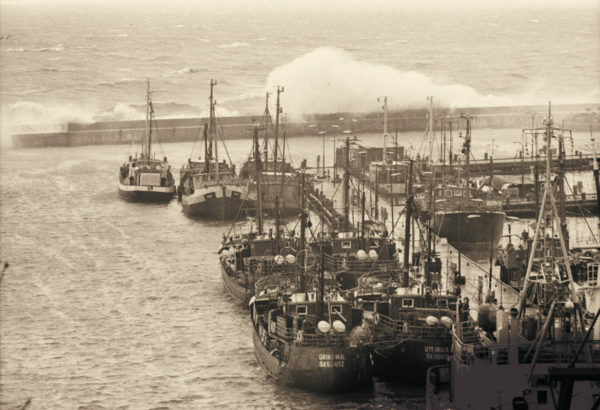 The order outlined the development of the East German fishing industry. Plans to increase catch and production quantities and to expand fishing activities also into the North Sea as early as the beginning of the 1950s, confronted the company with new challenges. Following an expansion program, new jetties, a new fish hall, an ice factory and a social building were built in the town’s harbour within just two years. 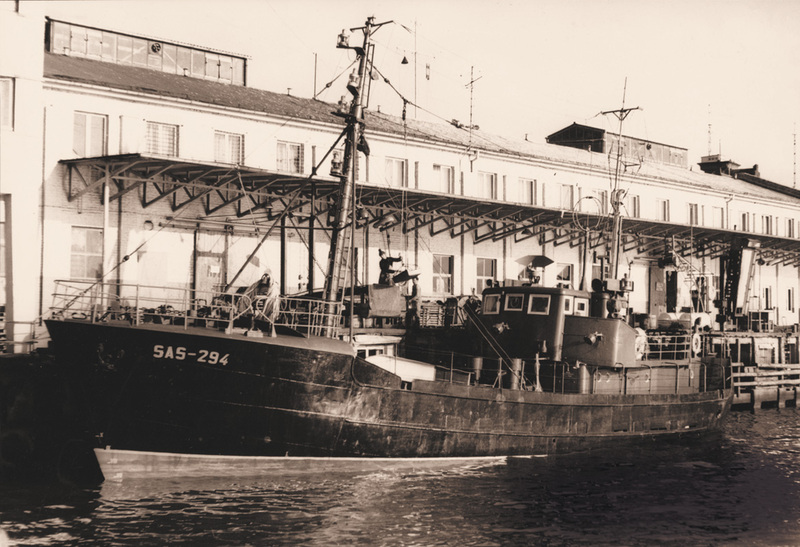 After the introduction of new cutter types, the Sassnitz fishing fleet owned 186 fishing boats at the end of 1952: 124 fishing cutters with a length of 17 meters, 11 fishing cutters with a length of 21 meters and 51 fishing cutters with a length of 24 meters. Experiences gained from fishing in the North Sea led to the development of 26,5-meter-vessels, 50 of which being stationed here in Sassnitz harbour. After the mid-1960s, 15 trawlers and two reefer/cargo ships („Kühl- und Transportschiffe/KTS“) were added to the fleet. Now, ships from Sassnitz could also be seen in far off fishing zones: at the Northwest coast of Africa, in the Bay of Biscay, in the Georges Bank and in the Barents Sea. The liquidation of the „VEB Fischfang Sassnitz” in 1990 marks the end of the local industrial deep-sea fishing. After that, only few fishermen were brave enough to start their own businesses. You can call this type of vessel the backbone of Sassnitz’s fishing fleet. Operated by a crew of 7, it sailed through the Baltic Sea, the North Sea and even towards Africa. Even if out- numbered by other cutter types in Sassnitz harbour, the introduction of this 26,5m-cutter, called the „26er”, was a significant innovation for Sassnitz’s fishing industry. As soon as new, far off fishing areas could be reached, a new type of cutter was called for. On July 16th, 1956, the first „26er” was launched at the shipyard „Stralsunder Volkswerft”. It was named „Elbe” and given the identification number SAS 270. 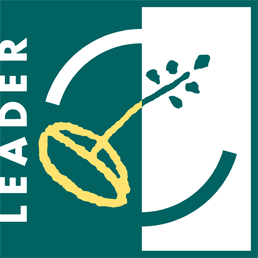 It started its service in January 1957. 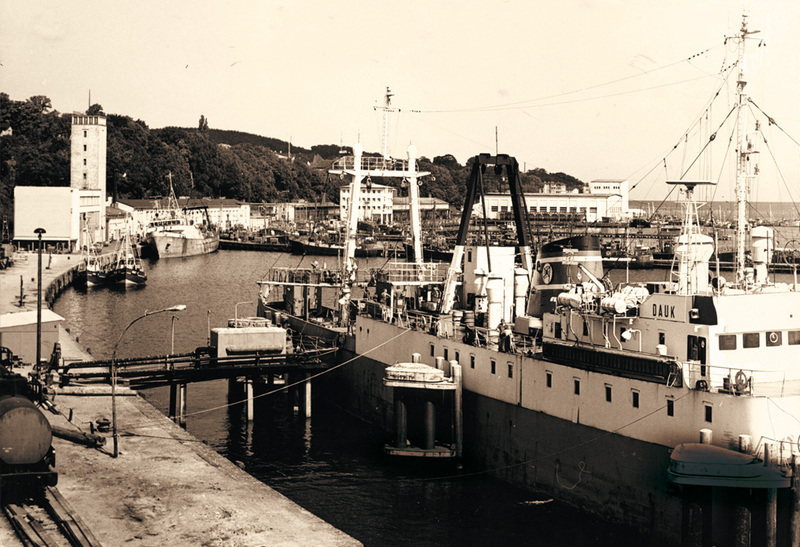 In 1959, SAS 320 „Sternhai” was the last of the „26ers” put into operation in Sassnitz. This meant that, at that time, the company „Fischfang Sassnitz” owned 50 of these modern fishing cutters. The „26ers” were famous for their storm resistance. As the forecastle was protected, rough seas could be mastered easily. The special shape of its stern offered additional protection against bad weather and strong waves which is why you could often hear the call: “Take them on in reverse!“. The SAS 274 „Havel” is the last original 26,5m fishing cutter, now representing the 50 „26ers“, that used to shape the harbour’s image for decades. May 1st, 1897 was a meaningful day for the neighbouring communes Crampas and Sassnitz as well as for the Swedish town of Trelleborg: The mail steamship line Sassnitz-Trelleborg started its regular services. Economy started booming in the harbourtowns and the shipping line ensured employment even after the end of the tourist seasons. Railway and mail services, customs and transport companies provided new jobs in both communes. 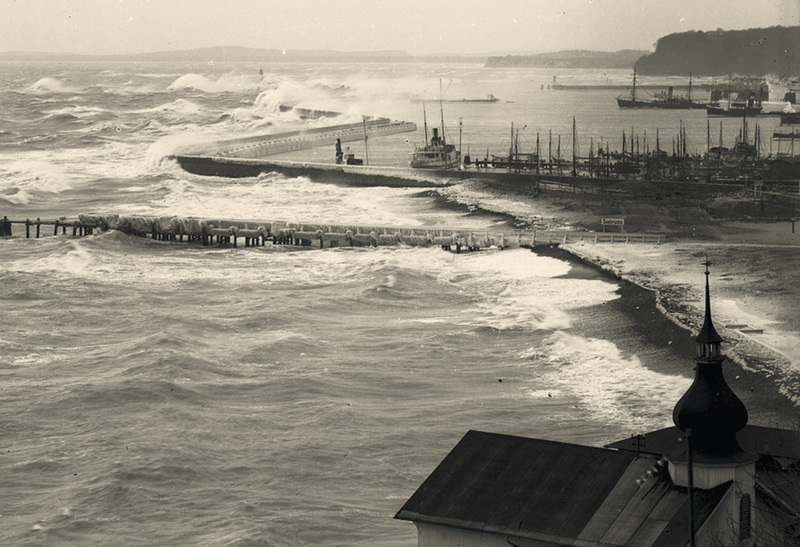 At first, Crampas/Sassnitz only planned to build a sheltered fishing harbour without any international relevance. However, Adolph von Hansemann, at that time one of Prussia’s richest men and owner of the castle „Dwasieden” with extensive lands West of Crampas, also had a strong interest in a German-Swedish transportation port. When debating with the government, he successfully pointed out, that not building the port would be a lost opportunity, leaving Denmark all the profit of the considerable traffic with Sweden. 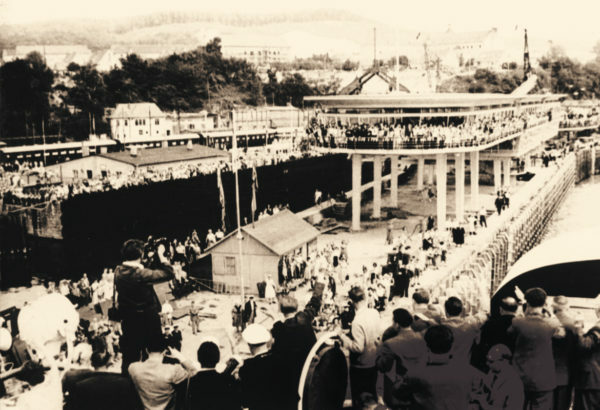 Soon, construction work began: a rail connection between the railway station and the port and a station at the port (including embankments in the port area) were constructed and fast mail steamers built. 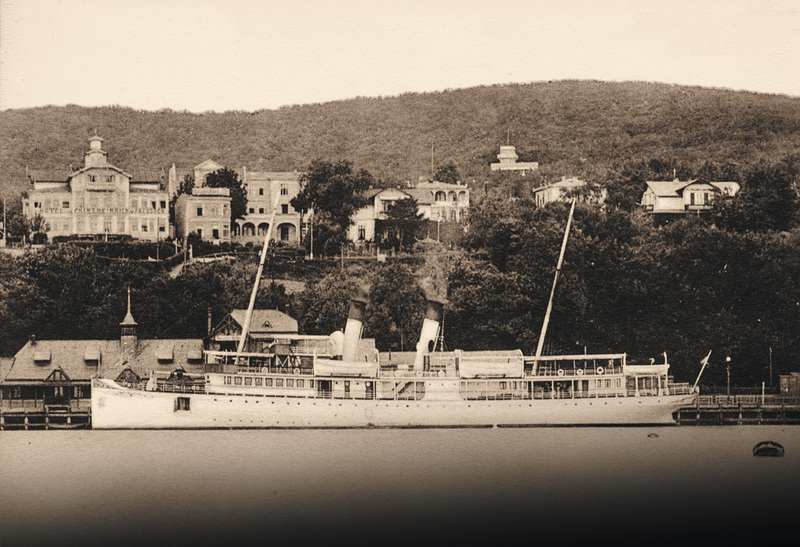 Despite bad weather threatening the set schedule, the mail steamship service was put into operation on time. The steamship line proved its worth and characterized an important stage in the economic development of the town in the early 20th century. 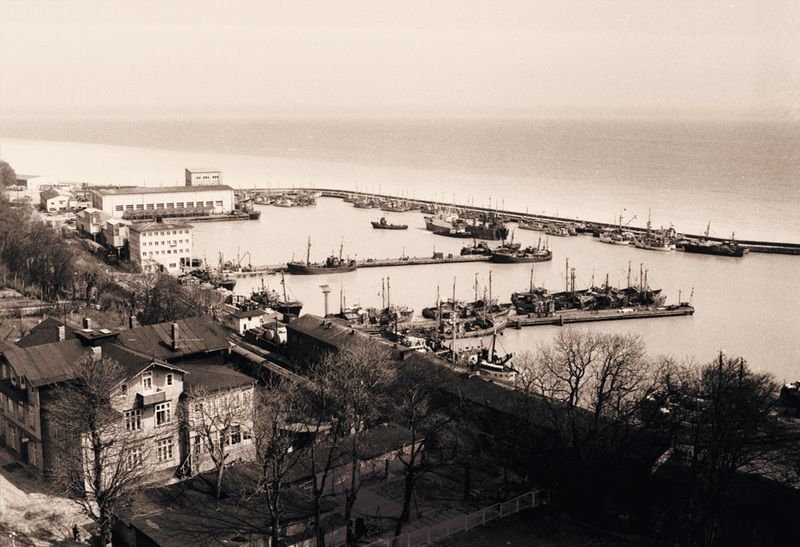 In the 1990s, following a significant decline in fishing activities and the transfer of the ferry services to the Port of Mukran, a new function for Sassnitz harbour was being discussed. The first question to be answered was, how to integrate the port into urban life and, especially, how to connect it to the town center. After three years of planning, the construction of this suspension bridge started in May 2006. Since 2007, it has been connecting the town center with the town harbour, an urban bond which benefits both parts of the town. Rising to a height of 20 meters it offers a magnificent view of the town harbour and the open sea. The bridge, designed by the engineering office „Schlaich, Bergermann & Partner”, was awarded the German Bridge Construction Award in the category „pedestrian and bicycle bridges“ in March 2010. 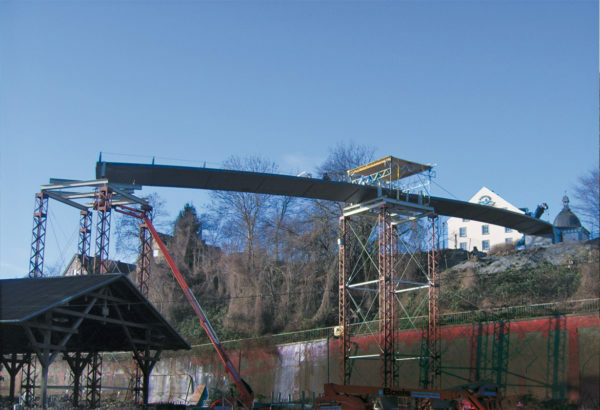 It consists of a 35m long ramp at the Rügen-square, a 124m long ramped bridge and, last but not least, the intermediate section – a 119m long suspension bridge whose mast has a total height of 43m. The special feature of this structure, technically referred to as a “circular ring girder bridge“, is the one-sided suspension to the inside of the curved bridge, allowing an undisturbed view towards the sea. From the very beginning, the structure was met with general approval and today, it is more than just a bridge, but a promenade with Baltic Sea view – it is “a balcony to the sea”. By the end of the 19th century, ferries transporting railway-cars were no utopia anymore. 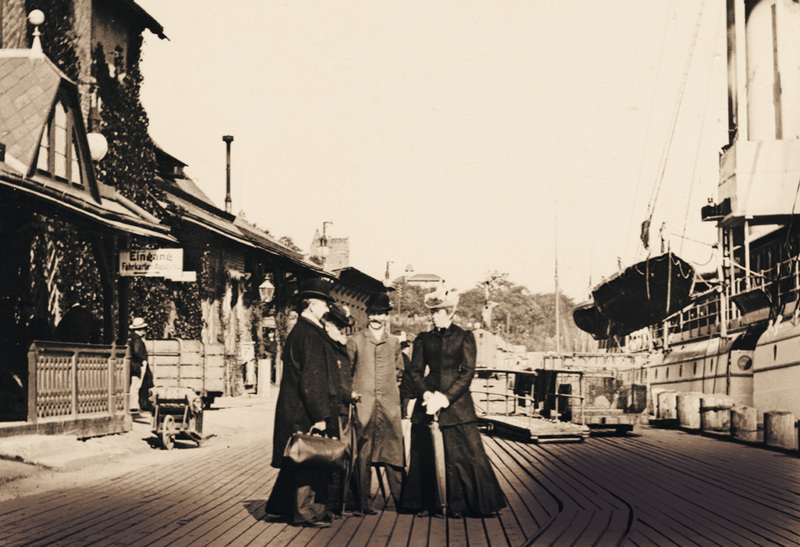 Already one year after the inauguration of its mail-steamer line, the town of Trelleborg tried to establish a rail-ferry service as the ferry route between Warnemünde, Mecklenburg and Gedser, Denmark, opened in 1903, constituted severe competition. Preparations were in full force. Despite different suggestions, for economic reasons the Prussian side stuck to Sassnitz being the port of departure. In May 1908, the project’s execution was agreed upon and its inauguration was scheduled for July 1909. 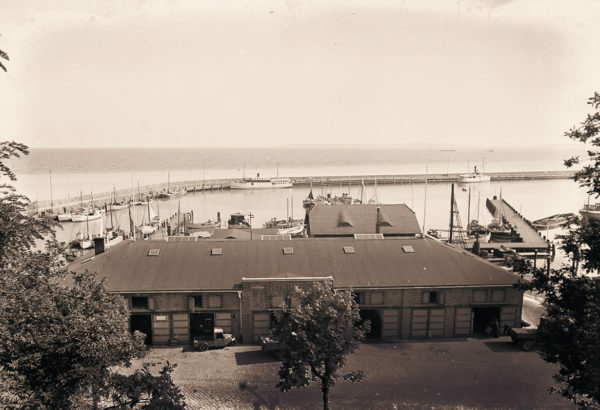 This aspiring goal was achieved: within one year, the port of Trelleborg and the port of Sassnitz had been rebuilt to be used as ferry ports, and the „Königslinie” shipping line could be put into operation on July 6th, 1909. Apart from an interruption between 1944 and 1948 which was caused by the war and its consequences, the ferry service continued operation using its old ships and facilities until the 1950s, when rising international traffic standards required the new building of both ferries and ferry docks. 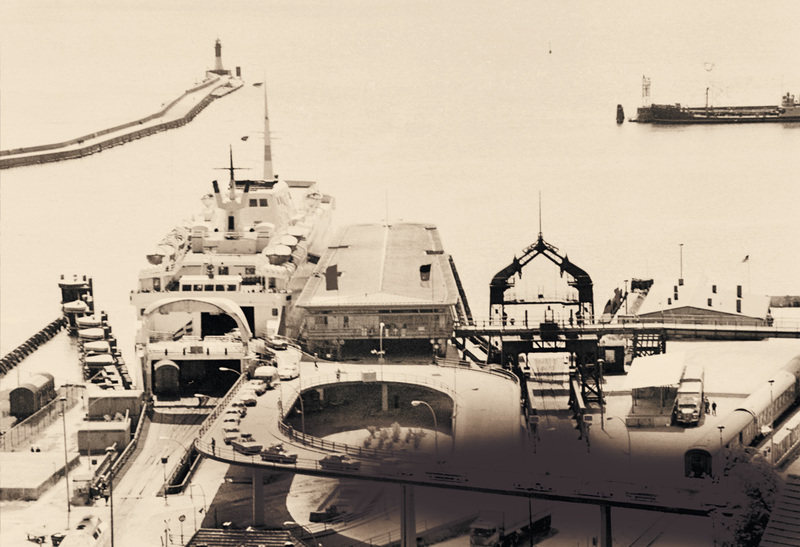 Therefore, between 1956 and 1959, ferry rack 1 was rebuilt while regular ferry services continued operation. Furthermore, a steel-and-glass reception hall and a bridge for cars, resting on piers, were constructed. While the bridge did not pass the test of time, the waiting hall was declared an architectural monument and is now commonly referred to as the „Glasbahnhof“ (glass station). 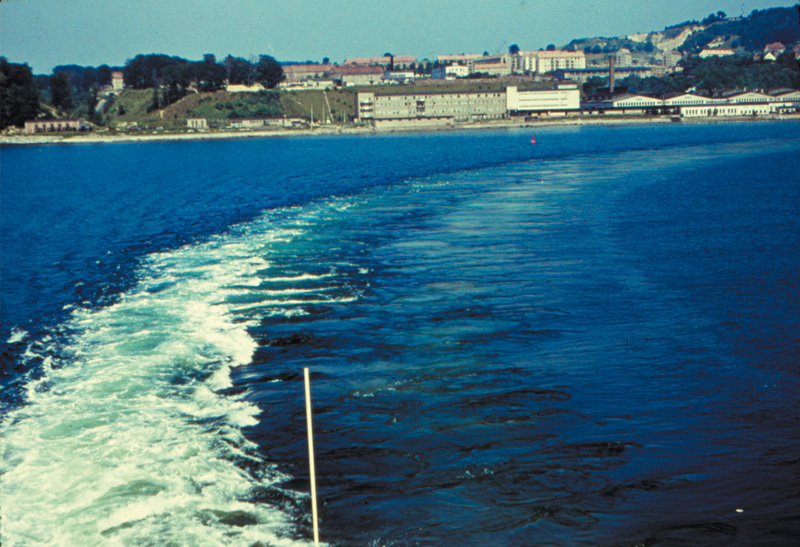 Ferry services were operated from Sassnitz’s town harbour until January 1998, when they were moved to the new ferry terminal in Mukran. A small smokehouse in a courtyard on the Seestraße – this is how local fish processing business started in 1949. Just a few decades later, products such as “Kippers in Oil“, “Herring Fillets in Cream Sauce with Horseradish” or “Scomber Mix” were well-known and sought after throughout the republic and even abroad. Soon, the old facilities proved to be insufficient to meet the rising demand and, in 1951, the construction of a new fish-processing plant started. In 1957, fish processing was separated from fishing and was now standing on its own. Apart from the development of a production line for canned fish in glass packaging, the production of smoked fish was expanded so that in 1959, the fish-processing factory „Fischwerk” could proudly call itself Europe’s largest fish smokery. Due to increasing production figures, several production segments were moved to different branches. 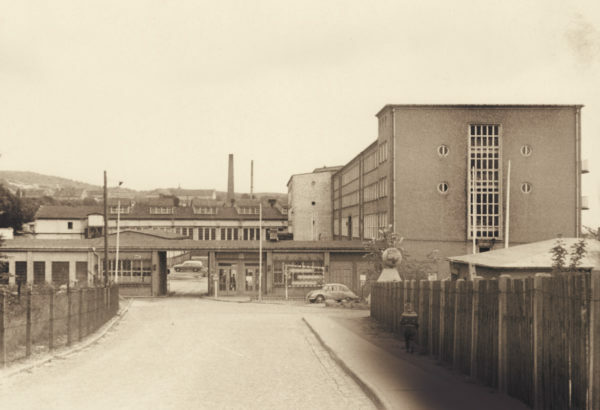 In Sassnitz, the factory focused mainly on the production of canned fish. In the 1980s, about 1,200 people were employed at the „Fischwerk” and its branches. 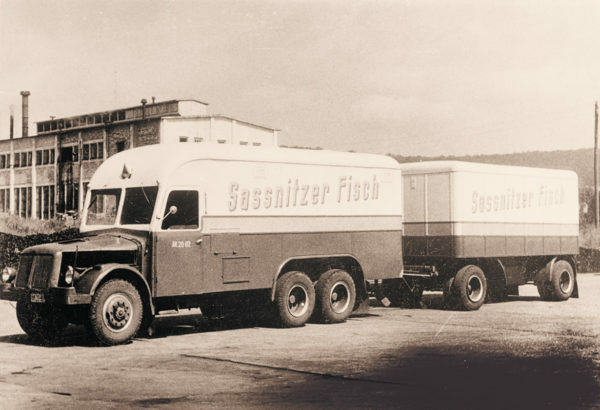 On June 30th, 1990, the „VEB Fischwerk Sassnitz” was liquidated and the „Rügenfisch GmbH” founded on July, 1st of the same year. After difficult first years, shaped by dropping production quantities and bankrupt investors, the company gradually recovered. In 2000, the foundation stone for a new factory was placed. The company was transformed into a public company in 2007 and named „Rügen Fisch AG“. Today, it is Germany’s biggest manufacturer of canned fish. 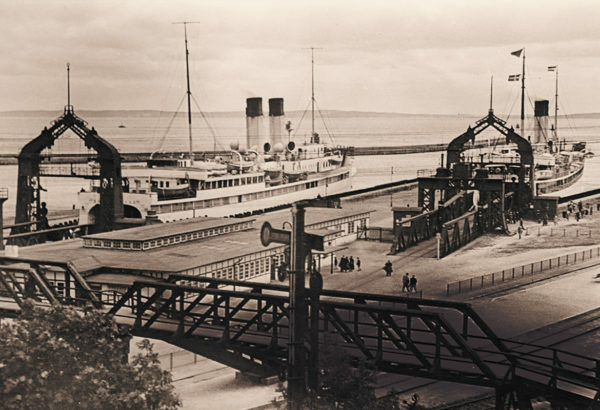 The city harbour of Sassnitz („Stadthafen“) played a crucial part in the development of the Baltic Sea resort into a city. It was created in 1889 as a small, sheltered fishing port and turned into an international traffic hub in just a short period of time. Baltic Sea traffic started in 1897 with the mail steamer line to Trelleborg, and would be known under the name „Königslinie“ – due to the presence of the German Emperor Wilhelm II and the Swedish King Gustav V at the opening. 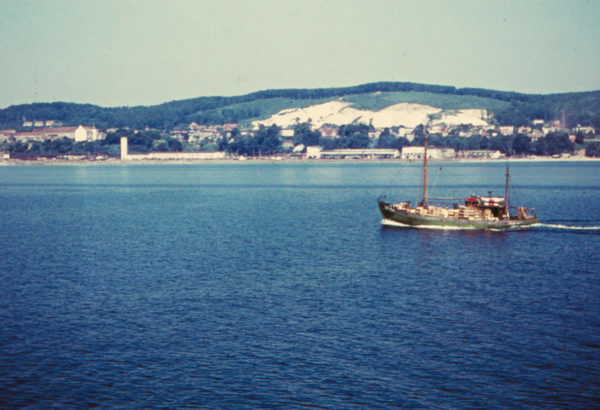 In 1949, Sassnitz was developed to be the second largest location of the GDR fishing industry, and the harbour was restructured extensively. 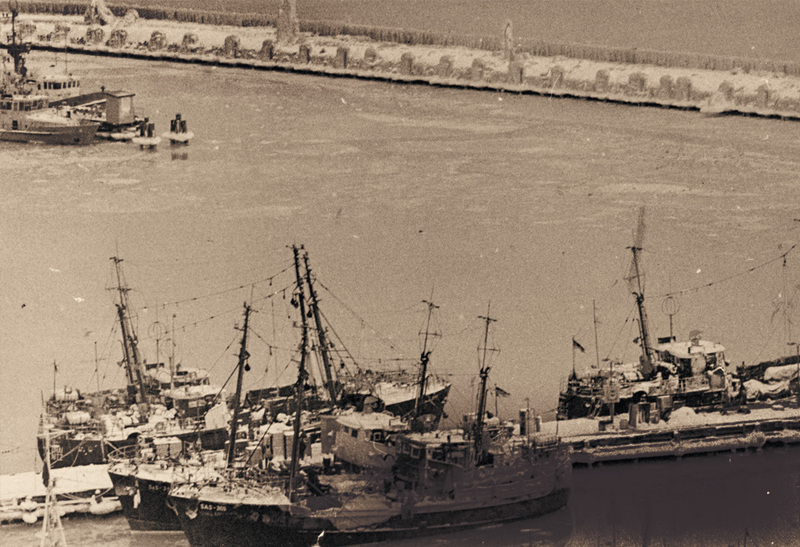 About 200 fishing ships were stationed in the harbour over the following years. The arrival of many of the worker´s families in the town meant a significant increase in the number of inhabitants, so that in the 1970s – at the peak – Sassnitz counted 17,000 citizens. 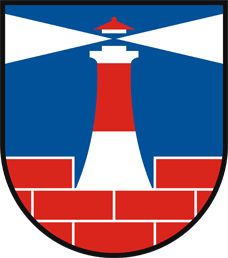 The political change brought change also to Sassnitz: The liquidation of the „VEB Fischfang“ fishing company and the loss of Sassnitz´s crucial importance regarding the ferry traffic to Scandinavia had a strong impact on the city, especially concerning the job market and, therefore, the number of inhabitants. Apart from historic relics as the mole, the old jetty and one of the original 26,5m cutters, this route also includes new buildings like the prominent pedestrian bridge or the traditional fish-processing company „Rügen Fisch“.